The subscapularis is the largest and most powerful of the rotator cuff muscles5 and is more important for arm elevation than either the supraspinatus or infraspinatus [1Denard PJ, Burkhart SS. Arthroscopic recognition and repair of the torn subscapularis tendon. Arthrosc Tech 2013 Oct 7; 2(4): e373-9. [http://dx.doi.org/10.1016/j.eats.2013.05.007] ]. Rupture of subscapularis (SSC) tendon is not as common as supraspinatus or infraspinatus tear, while the treatment modalities have been controversial [1Denard PJ, Burkhart SS. Arthroscopic recognition and repair of the torn subscapularis tendon. Arthrosc Tech 2013 Oct 7; 2(4): e373-9. [http://dx.doi.org/10.1016/j.eats.2013.05.007] , 2Jeong JY, Pan HL, Song SY, Lee SM, Yoo JC. Arthroscopic subscapularis repair using single-row mattress suture technique: clinical results and structural integrity. J Shoulder Elbow Surg 2018; 27(4): 711-9. [http://dx.doi.org/10.1016/j.jse.2017.08.009] [PMID: 29054 384] ]. Although subscapularis’ pathology is both infrequently identified and not commonly considered as a major source of shoulder pain [3Tung GA, Yoo DC, Levine SM, Brody JM, Green A. Subscapularis tendon tear: primary and associated signs on MRI. J Comput Assist Tomogr 2001; 25(3): 417-24. [http://dx.doi.org/10.1097/00004728-200105000-00015] [PMID: 113 51193] ], tears of subscapularis tendon have been lately gained increasing attention amongst physi-cians [4Ticker JB, Burkhart SS. Why repair the subscapularis? A logical rationale. Arthroscopy 2011; 27(8): 1123-8. [http://dx.doi.org/10.1016/j.arthro.2011.03.001] [PMID: 2170 4473] ]. Arthroscopic subscapularis repair has been estab-lished as a feasible option for the treatment of isolated subscapularis tears, which might obtain satisfactory functional and patient-reported clinical outcomes [5Saltzman BM, Collins MJ, Leroux T, et al. Arthroscopic Repair of Isolated Subscapularis Tears: A Systematic Review of Technique-Specific Outcomes. Arthroscopy 2017; 33(4): 849-60. [http://dx.doi.org/10.1016/j.arthro.2016.10.020] [PMID: 280 82063] ]. A combination of physical examination tests has been used to determine the presence and size of subscapularis tears [6Denard PJ, Lädermann A, Burkhart SS. Arthroscopic management of subscapularis tears. Sports Med Arthrosc Rev 2011; 19(4): 333-41. [http://dx.doi.org/10.1097/JSA.0b013e31822d41c6] [PMID: 2208 9282] ]. It has been suggested that the Napoleon test as well as the bear hug test, the internal rotation lag sign and the lift-off test are all specific for the examination of subscapularis tendon and its pathology [7Faruqui S, Wijdicks C, Foad A. Sensitivity of physical examination versus arthroscopy in diagnosing subscapularis tendon injury. Orthopedics 2014; 37(1): e29-33. [http://dx.doi.org/10.3928/01477447-20131219-13] [PMID: 24683 653] -11Longo UG, Berton A, Marinozzi A, Maffulli N, Denaro V. Subscapularis tears. Med Sport Sci 2012; 57: 114-21. [http://dx.doi.org/10.1159/000328886] [PMID: 21986050] ]. Hertel et al. reported that the internal rotation lag sign was more sensitive than the lift-off test for the diagnosis of subscapularis tears [10Hertel R, Ballmer FT, Lombert SM, Gerber C. Lag signs in the diagnosis of rotator cuff rupture. J Shoulder Elbow Surg 1996; 5(4): 307-13. [http://dx.doi.org/10.1016/S1058-2746(96)80058-9] [PMID: 887 2929] ]. Faruqui et al. were the first who evaluated the sensitivity of three separate clinical tests as a composite [7Faruqui S, Wijdicks C, Foad A. Sensitivity of physical examination versus arthroscopy in diagnosing subscapularis tendon injury. Orthopedics 2014; 37(1): e29-33. [http://dx.doi.org/10.3928/01477447-20131219-13] [PMID: 24683 653] ]. According to them, the sensitivity of physical examination as a whole in diagnosing primary subs-capularis tears was 81% [7Faruqui S, Wijdicks C, Foad A. Sensitivity of physical examination versus arthroscopy in diagnosing subscapularis tendon injury. 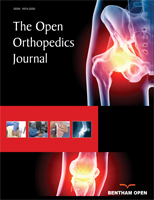 Orthopedics 2014; 37(1): e29-33. [http://dx.doi.org/10.3928/01477447-20131219-13] [PMID: 24683 653] ]. In comparison with other clinical tests, Takeda et al. found that the bear hug test had the greatest specificity and positive prognostic value [8Takeda Y, Fujii K, Miyatake K, Kawasaki Y, Nakayama T, Sugiura K. Diagnostic Value of the Supine Napoleon Test for Subscapularis Tendon Lesions. Arthroscopy 2016; 32(12): 2459-65. [http://dx.doi.org/10.1016/j.arthro.2016.04.034] [PMID: 273 49714] ]. In addition, the Napoleon test had the greatest sensitivity and negative prog-nostic value [8Takeda Y, Fujii K, Miyatake K, Kawasaki Y, Nakayama T, Sugiura K. Diagnostic Value of the Supine Napoleon Test for Subscapularis Tendon Lesions. Arthroscopy 2016; 32(12): 2459-65. [http://dx.doi.org/10.1016/j.arthro.2016.04.034] [PMID: 273 49714] ]. Finally, Schiefer et al. illustrated that the bear hug test had the highest sensitivity and negative predictive values in diagnosing primary subscapularis tears, when com-pared with the Napoleon test, the belly press and lift-off tests [9Schiefer M, Júnior YA, Silva SM, et al. Clinical Diagnosis of subscapularis tendon tear using the bear hug semiological maneuver. Rev Bras Ortop 2015; 47(5): 588-92. [http://dx.doi.org/10.1016/S2255-4971(15)30008-2] [PMID: 270 47870] ]. On the contrary, no clinical trial has been published yet to assess the diagnostic validity of the aforementioned tests for the diagnosis of subscapularis retears after arthroscopic subs-capularis repair. Our aim was to investigate the diagnostic value of the most commonly used clinical tests for the diag-nosis of subscapularis tendon retears after arthroscopic repair. Our hypothesis was that the postoperative physical exami-nation of repaired subscapularis tendon, which was based on subscapularis-specific clinical tests, would be proven accurate for the diagnosis of potential retears. We retrospectively (based on prospectively collected data) reviewed 37 consecutive patients suffering fromsymptomatic subscapularis tear who were operated by two senior surgeons (EF, AC) in two medical teaching centers of high caliber. This study was carried out in accordance with the World Medical Association Declaration of Helsinki in 1964 and its more recent amendments. The overall period of recruitment was 16 months (November 2012-March 2014). We included in our study adult patients who were treated with all-arthroscopic anatomic repair of subscapularis tendon tears (regardless of the size of the tear). The follow-up for each patient was at least 12 months. We planned to exclude from our retrospective analysis: 1) patients <18 years 2) those who were reoperated on the same shoulder in the past, 3) individuals who did not undergo an arthroscopic treatment of the subscapularis tear or 4) they were treated with a non-anatomic repair (partial or medialized) of subscapularis or 5) had a follow-up less than 12 months, 6) those who did not have a preoperative MRI confirmation of the subscapularis tear, 7) patients suffering from systematic or autoimmune diseases, cancer, psychiatric diseases and uncon-trolled hormonal diseases. The technique which was used for the arthroscopic repair of the subscapularis tendon was similar for all patients. A typical shoulder arthroscopy on lateral decubitus position with the use of a 30° scope was performed. A diagnostic glenohu-meral arthroscopy was carried out. After meticulous debri-dement and posterior humeral head translation for better visualization, subscapularis was assessed with the use of an arthroscopic probe in various degrees of arm rotation. The subscapularis tendon was mobilized and sutured back on its anatomic position with the use of one or two suture anchors depending on the extent of the tear. The subscapularis repair was assessed in internal and external rotation with the use of a probe. Tenotomy or tenodesis of the long head of biceps was performed in all cases. Then, bursoscopy was performed and the posterior cuff was evaluated. Whenever repair was con-sidered necessary, the cuff was debrided, mobilized and fixed with suture anchors on a single row configuration depending on the tear size. All patients were pre and postoperatively evaluated with specific clinical tests for the evaluation of subscapularis inte-grity. The clinical tests were performed by experienced shoulder surgeons, always with the patient sitting. These tests comprised the internal rotation lag sign, the Napoleon test, the bear-hug and lift-off tests [7Faruqui S, Wijdicks C, Foad A. Sensitivity of physical examination versus arthroscopy in diagnosing subscapularis tendon injury. Orthopedics 2014; 37(1): e29-33. [http://dx.doi.org/10.3928/01477447-20131219-13] [PMID: 24683 653] -10Hertel R, Ballmer FT, Lombert SM, Gerber C. Lag signs in the diagnosis of rotator cuff rupture. J Shoulder Elbow Surg 1996; 5(4): 307-13. [http://dx.doi.org/10.1016/S1058-2746(96)80058-9] [PMID: 887 2929] , 12Barth JR, Burkhart SS, De Beer JF. The bear-hug test: a new and sensitive test for diagnosing a subscapularis tear. Arthroscopy 2006; 22(10): 1076-84. [http://dx.doi.org/10.1016/j.arthro.2006.05.005] [PMID: 170 27405] ]. Typical position of the patient for the examination of the internal rotation lag sign. Particularly, the internal rotation lag sign was evaluated with the patient’s arm held by the physician at almost maximal internal rotation [10Hertel R, Ballmer FT, Lombert SM, Gerber C. Lag signs in the diagnosis of rotator cuff rupture. J Shoulder Elbow Surg 1996; 5(4): 307-13. [http://dx.doi.org/10.1016/S1058-2746(96)80058-9] [PMID: 887 2929] ]. Then, each patient was asked to actively maintain this position (Fig. 1 ). The sign was considered posi-tive when lag occurred [10Hertel R, Ballmer FT, Lombert SM, Gerber C. Lag signs in the diagnosis of rotator cuff rupture. J Shoulder Elbow Surg 1996; 5(4): 307-13. [http://dx.doi.org/10.1016/S1058-2746(96)80058-9] [PMID: 887 2929] ]. The magnitude of the lag was recorded to the nearest 5°. An obvious drop of the hand may occur with large subscapularis tears. A slight lag indicated a partial tear of the cranial part of the subscapularis tendon [10Hertel R, Ballmer FT, Lombert SM, Gerber C. Lag signs in the diagnosis of rotator cuff rupture. J Shoulder Elbow Surg 1996; 5(4): 307-13. [http://dx.doi.org/10.1016/S1058-2746(96)80058-9] [PMID: 887 2929] ]. In addition, the lift-off test was examined as described by Gerber and Krushell [13Gerber C, Krushell RJ. Isolated rupture of the tendon of the subscapularis muscle. Clinical features in 16 cases. J Bone Joint Surg Br 1991; 73(3): 389-94. [http://dx.doi.org/10.1302/0301-620X.73B3.1670434] [PMID: 1670 434] ]. Each patient was initially asked to perform maximum internal rotation with the dorsum of his/her hand on his/her back. As the next step, each patient was asked to lift the hand off of his/her back [13Gerber C, Krushell RJ. Isolated rupture of the tendon of the subscapularis muscle. Clinical features in 16 cases. J Bone Joint Surg Br 1991; 73(3): 389-94. [http://dx.doi.org/10.1302/0301-620X.73B3.1670434] [PMID: 1670 434] ]. The test was considered positive if the patient was unable to do so [13Gerber C, Krushell RJ. Isolated rupture of the tendon of the subscapularis muscle. Clinical features in 16 cases. J Bone Joint Surg Br 1991; 73(3): 389-94. [http://dx.doi.org/10.1302/0301-620X.73B3.1670434] [PMID: 1670 434] ]. The Napoleon sign was assessed by placing the patient’s hand parallel to the grand on his/her abdomen and with the elbow in forward flexion (Fig. 2 ). If the patient was not able to actively maintain this position and the wrist was flexed at an angle of more than 30° the test was considered positive [14Burkhart SS, Tehrany AM. Arthroscopic subscapularis tendon repair: Technique and preliminary results. Arthroscopy 2002; 18(5): 454-63. [http://dx.doi.org/10.1053/jars.2002.30648] [PMID: 119870 54] ]. (a) Position of the ipsilateral upper limb in order to evaluate the Napoleon sign. (b) In this case (healthy volunteer), this position was maintained, so that the sign was not documented. Finally, the bear-hug test was typically performed with the palm of the affected limp placed on the opposite shoulder, while the ipsilateral fingers were extended and the elbow was flexed [12Barth JR, Burkhart SS, De Beer JF. The bear-hug test: a new and sensitive test for diagnosing a subscapularis tear. Arthroscopy 2006; 22(10): 1076-84. [http://dx.doi.org/10.1016/j.arthro.2006.05.005] [PMID: 170 27405] ]. The patient was then asked to hold that position as the examiner was pulling his/her hand away from the cont-ralateral shoulder (Fig. 3 ). The test was considered positive if the patient could not hold their hand against his or her shoulder [12Barth JR, Burkhart SS, De Beer JF. The bear-hug test: a new and sensitive test for diagnosing a subscapularis tear. Arthroscopy 2006; 22(10): 1076-84. [http://dx.doi.org/10.1016/j.arthro.2006.05.005] [PMID: 170 27405] ]. Shoulder function was also pre and postoperatively evaluated by using the Constant-Murlay subjective score (CS). Postoperative assessments were made at the final follow up appointment (12 months after surgery). Immobilizer was used in all cases for four weeks. During this period the immobilizer was removed only for hygiene and elbow exercises. From the first postoperative day, active elbow, wrist and hand motions were allowed. At four weeks the immobilizer was removed and assisted active and passive Range of Motion (RoM) to tolerance were allowed. At eight weeks resistive exercises for scapular stabilizers, biceps, triceps and rotator cuff started. At twelve weeks the goal was to gradually gain active full RoM, while muscle endurance activities might began. One of the aforementioned two physicians (senior orthopaedic surgeons: EF, AC) carried out all the operations and preoperatively evaluated the patients (clinical tests, CS). In addition, two other orthopaedic surgeons assessed the patients in the follow-up period (clinical tests, CS). These last two physicians were blinded to the initial preoperative clinical and functional results of the patients as well as their postoperative sonographic results. Furthermore, one of two senior radio-logists evaluated the arthroscopic repair of the rotator cuff in the follow-up. These two radiologists were blinded both to the preoperative and postoperative clinical and functional out-comes. Position of the affected limb on the contralateral shoulder for the examination of the bearhug test. All patients were postoperatively evaluated with the use of ultrasonography by one of two senior radiologists (AP, FL) specialized in musculoskeletal shoulder ultrasound. A linear 12 Mhz probe (Logiq S8; GE Healthcare, Seoul, Korea and iu22; Philips Healthcare, Eindhoven, The Netherlands) was utilized for the sonographic examination, which was undertaken at 6 and 12 months after surgery. The ultrasound examination was carried out with the examiner sitting on a revolving stool facing the front of the patient who was also sitting on a stool. The same scanning protocol was performed in all patients included in our study. The checklist of the key structures which were under sono-graphic examination per patient included the long head of the biceps brachii tendon, the subscapularis, supraspinatus, infras-pinatus and teres minor tendons and finally the assessment of the supraspinatus and infraspinatus muscles for muscle atrophy. 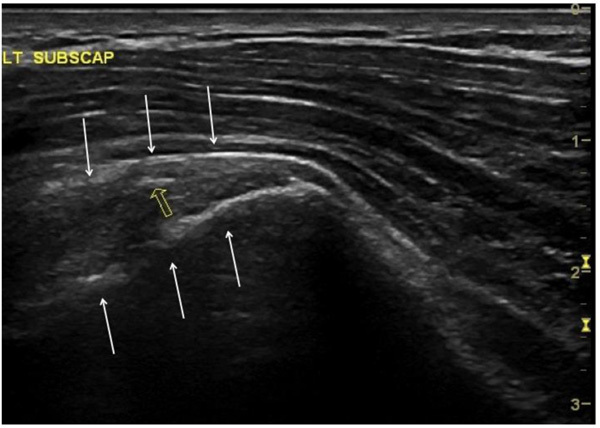 The postoperative ultrasound image of the repaired sub-scapularis tendons, along with any differences in structure or echogenicity compared to the normal, cont-ralateral subs-capularis tendons, were recorded (Fig. 4 ). Data were expressed as mean ± Standard Deviation (S.D.) for quantitative variables and as percentages for qualitative variables. The diagnostic results of the clinical tests were compared to the ultrasound findings in order to determine the sensitivity, specificity, positive and negative prognostic values, and accuracy of clinical tests. The comparison of preoperative and postoperative evaluation of CS was performed using the paired samples t-test. All tests were two-sided, a p-value of <0.05 was used to denote statistical significance. All analyses were carried out using the statistical package SPSS vr 17.00 (Statistical Package for the Social Science, SPSS Inc., Chicago, Ill., USA). Ultrasound examination 6 months after the repair reveals intact subscapularis tendon with normal fibrillar echostructure (arrows). Brightly echogenic suture material is identified within the tendon substance (void arrow). The average age of the patients at surgery was 62.3 years (31-74), the male to female ratio 22/15, and the right to left arm ratio 29/8. According to the intra-operative arthroscopic findings, ten patients were diagnosed with an isolated subs-capularis tear, while 27 patients had a subscapularis tear combined with other rotator cuff tears (supraspinatus, or both supraspinatus and infraspinatus). During the postoperative ultrasound examination all tendons of the rotator cuff were examined and retears of supraspinatus and infraspinatus tendons were reported. As a result, seven out of 23 patients with postero-superior cuff repairs (30.4%) had postoperative sonographic supraspinatus and/or infraspinatus retears, while there was no clinical indication of subscapularis retear in this category of patients. Nineteen out of 37 patients (51.4% of all patients) who were postoperatively found with all four clinical tests being negative for retear, had also sonographically intact subs-capularis tendons (true negative). So, we did not find any false negative patient in our sample (a patient with clinical tests as a composite who was documented negative for retear, while the ultrasound was positive). On the contrary, from the 18 patients (48.6% of all patients) who had at least one clinical test positive for subscapularis tendon retear, more than half (10 out of 18 patients: 55.6%) had intact tendons at the follow-up ultrasound (false positive). The combination of these clinical and sonographic findings resulted in three subgroups of patients: a true negative subgroup (19 patients), a true positive subgroup (8 patients) and a false positive subgroup (10 patients Table 1). A 55-year old male with traumatic, type III Romeo right subscapularis tendon tear. Non-intact subscapularis tendon postoperatively. (a) Left image: normal contralateral subscapularis tendon (b) Right: absent, retorn subscapularis tendon (arrows: subscapularis tendon). Correlation of clinical tests for subscapularis tendon retear with ultrasound findings. Sensitivity, specificity, PPV an NPV of clinical tests using the ultrasound findings as a gold standard method of diagnosis. The bear hug test had 87.5% sensitivity, 82.8% specificity, 83.8% accuracy, 58.3% positive predictive value and 96% negative predictive value in the diagnosis of subscapularis retears after complete arthroscopic repair. The Napoleon test had 62.5% sensitivity, with 89.6% specificity, 83.8% accuracy, 62.5% positive predictive value (PPV) and 89.6% negative predictive value (NPV) in the diagnosis of subscapularis retears after complete arthroscopic repair (Table 2). In addition, the lift-off test was found with 62.5% sensitivity, 68.9% specificity, 67.6% accuracy, 35.7% PPV and 86.9% NPV. Finally, the sensitivity of the internal rotation lag sign was estimated 100%, while the specificity was 50%, the accuracy 56.3%, and the positive and negative predictive values 22.2% and 100%, respectively. Regarding the functional outcomes, all 37 patients (100%) had significantly improved final postoperative values. From a mean preoperative CS: 31.5±9.8, we reached a final mean postoperative value of 68.0±12.7 (p<0,0005). In addition, the CS was significantly improved in all patient subgroups. Particularly, the p-value was <0,0005 in the true negative subgroup, <0,0016 in the false positive sub-group and <0,0005 in the true positive subgroup. Moreover, all those patients who were clinically found with a subscapularis tendon retear (18 patients: true positive and false positive patients) illustrated significant improvement in their final CS (p<0.005). The most important finding of our study was that the diagnostic value of the clinical tests for diagnosing subs-capularis retear was high when they were found negative. On the contrary, a high percentage of false positive results was reported, which jeopardizes the diagnostic value of the subscapularis-specific clinical tests after arthroscopic subs-capularis repair in the case that they are found positive. According to a relative systematic review, special tests for the diagnosis of subscapularis tears include the lift-off, belly-press, and bear-hug tests [11Longo UG, Berton A, Marinozzi A, Maffulli N, Denaro V. Subscapularis tears. Med Sport Sci 2012; 57: 114-21. [http://dx.doi.org/10.1159/000328886] [PMID: 21986050] ]. In a Level I diagnostic study, Barth et al. showed that the bear-hug test represents the most sensitive test [12Barth JR, Burkhart SS, De Beer JF. The bear-hug test: a new and sensitive test for diagnosing a subscapularis tear. Arthroscopy 2006; 22(10): 1076-84. [http://dx.doi.org/10.1016/j.arthro.2006.05.005] [PMID: 170 27405] ]. We utilized four different clinical tests in our study: the bear hug, the Napoleon, the lift-off and the internal rotation lag sign. The knowledge regarding the sensitivity of the sub-scapularis specific physical examination as a composite can lead practitioners to implement all clinical tests, even when one test has a negative finding, thus promoting a more thorough physical examination [7Faruqui S, Wijdicks C, Foad A. Sensitivity of physical examination versus arthroscopy in diagnosing subscapularis tendon injury. Orthopedics 2014; 37(1): e29-33. [http://dx.doi.org/10.3928/01477447-20131219-13] [PMID: 24683 653] ]. Performing all subscapularis-specific clinical tests has been proven more efficient in predicting the size of the tear than selecting only one specific clinical test [12Barth JR, Burkhart SS, De Beer JF. The bear-hug test: a new and sensitive test for diagnosing a subscapularis tear. Arthroscopy 2006; 22(10): 1076-84. [http://dx.doi.org/10.1016/j.arthro.2006.05.005] [PMID: 170 27405] ]. Concerning our clinical trial, we investigated the diag-nostic validity of the subscapularis clinical tests in the diagnosis of subscapularis retears. The assessment of each clinical test separately illustrated that the Napoleon sign was found with the highest specificity amongst all tests in diagnosing subscapularis retears, while the internal rotation lag sign had the highest sensitivity. In addition, the bear hug test and the Napoleon test were found with the highest accuracy (both with 83.8%). On the other hand, the lift off test was the one with the lower performance Table 2. It is established that the gold standard for the diagnosis of a rotator cuff retear is the second-look arthroscopy [15Magee T, Shapiro M, Hewell G, Williams D. Complications of rotator cuff surgery in which bioabsorbable anchors are used. AJR Am J Roentgenol 2003; 181(5): 1227-31. [http://dx.doi.org/10.2214/ajr.181.5.1811227] [PMID: 14573 409] ]. In our study we avoided to perform a second operation due to the significant clinical improvement of the patients who were suspicious for retear. On the contrary, we used ultrasound as the preferred imaging modality for the diagnosis of subscapularis retear after primary arthroscopic repair. Although an accurate physical examination is of para-mount importance, imaging modalities such as Magnetic Resonance Imaging (MRI), and ultrasound offer advanced knowledge of the spectrum of abnormalities involving the subscapularis tendon. Tung et al. have shown that subsca-pularis tears are frequently missed on MRI [3Tung GA, Yoo DC, Levine SM, Brody JM, Green A. Subscapularis tendon tear: primary and associated signs on MRI. J Comput Assist Tomogr 2001; 25(3): 417-24. [http://dx.doi.org/10.1097/00004728-200105000-00015] [PMID: 113 51193] ]. Compared with posterosuperior rotator cuff tears, MRI detection of subscapularis is less reliable and therefore requires a high index of suspicion [6Denard PJ, Lädermann A, Burkhart SS. Arthroscopic management of subscapularis tears. Sports Med Arthrosc Rev 2011; 19(4): 333-41. [http://dx.doi.org/10.1097/JSA.0b013e31822d41c6] [PMID: 2208 9282] ]. On the other hand, shoulder ultrasound is nowadays extensively used for the accurate evaluation of the rotator cuff pathology [16Farin P, Jaroma H. Sonographic detection of tears of the anterior portion of the rotator cuff (subscapularis tendon tears). J Ultrasound Med 1996; 15(3): 221-5. [http://dx.doi.org/10.7863/jum.1996.15.3.221] [PMID: 8919 503] -18Teefey SA, Hasan SA, Middleton WD, Patel M, Wright RW, Yamaguchi K. Ultrasonography of the rotator cuff. A comparison of ultrasonographic and arthroscopic findings in one hundred consecutive cases. J Bone Joint Surg Am 2000; 82(4): 498-504. [http://dx.doi.org/10.2106/00004623-200004000-00005] [PMID: 1076 1940] ]. Several studies have proven the efficacy of the ultrasound imaging modality in the postoperative assessment of the rotator cuff repair after arthroscopic surgery [19Park JY, Siti HT, Keum JS, Moon SG, Oh KS. Does an arthroscopic suture bridge technique maintain repair integrity? : a serial evaluation by ultrasonography. Clin Orthop Relat Res 2010; 468(6): 1578-87. [http://dx.doi.org/10.1007/s11999-009-0990-8] [PMID: 196 29607] -21Nho SJ, Brown BS, Lyman S, Adler RS, Altchek DW, MacGillivray JD. Prospective analysis of arthroscopic rotator cuff repair: prognostic factors affecting clinical and ultrasound outcome. J Shoulder Elbow Surg 2009; 18(1): 13-20. [http://dx.doi.org/10.1016/j.jse.2008.05.045] [PMID: 1879 9326] ]. High-resolution ultra-sonography may not only assess the operated tendon’s integrity, but also evaluate the postoperative tendon’s position and echostructure. Our study confirmed that most repaired subscapularis tendons had fibrillar echotexture postoperatively and similar sonographic qualitative characterictics to the contralateral normal tendons. The holes which were drilled by the treated surgeon on the lesser tubercle were sonographically identified as bone depression. Furthermore, the sutures were sonographically visible on the initial examination (6 months postoperatively) as echogenic foci within the tendon substance. Those subs-capularis tendons which were sonographically intact at 6 months after surgery were also maintained intact after 12 months. Shoulder ultrasound has been used in several studies as the reference examination for the estimation of the diagnostic values of the various clinical tests [22Kamath G, Galatz LM, Keener JD, Teefey S, Middleton W, Yamaguchi K. Tendon integrity and functional outcome after arthroscopic repair of high-grade partial-thickness supraspinatus tears. J Bone Joint Surg Am 2009; 91(5): 1055-62. [http://dx.doi.org/10.2106/JBJS.G.00118] [PMID: 194 11453] -24Ratti C, Murena L, Surace MF, Rolla PR. Clinical and ultrasound results after arthroscopic repair of the rotator cuff. Chir Organi Mov 2005; 90(2): 95-104. [PMID: 16422234] ]. Taking into consideration the correlation that we found in our study between the clinical findings as a composite and the ultrasound findings, we divided our patients into three subgroups (true negative, true positive, false positive subgroups). Especially regarding the false positive subgroup, although postoperative ultrasound demonstrated an intact subscapularis tendon, the follow-up clinical evaluation implied that there was retear. If all subscapularis specific clinical tests are negative for retear, then we could safely be based on them for the patient’s postoperative assessment (no false negative findings in our study). On the contrary, when a subscapularis specific clinical test is positive for retear, then we should proceed to further examinations for the accurate evaluation of the patient (due to high rate of false positive results). A significant improvement in shoulder’s function was also illustrated, when we compared the preoperative and follow-up values of the CS, regardless of the individual’s outcome as assessed by the clinical tests or the ultrasound. The functional improvement in these patients who had a clinically successful repair was something to be expected. Contrariwise, an interesting point of our study was the significant functional improvement that was documented in the mean postoperative CS of the false positive subgroup (patients who had a sonographically intact subscapularis repair but at least one positive postoperative clinical test). We might assume that this result could be due to the unique role which the subscapularis plays as an anterior restraint of the humerus. It has been proven that subscapularis assists in the provision of a fulcrum of motion even in the absence of contractile elements [25Lee SB, Kim KJ, O’Driscoll SW, Morrey BF, An KN. Dynamic glenohumeral stability provided by the rotator cuff muscles in the mid-range and end-range of motion. A study in cadavera. J Bone Joint Surg Am 2000; 82(6): 849-57. [http://dx.doi.org/10.2106/00004623-200006000-00012] [PMID: 108 59105] , 26Halder AM, Zhao KD, Odriscoll SW, Morrey BF, An KN. Dynamic contributions to superior shoulder stability. J Orthop Res 2001; 19(2): 206-12. [http://dx.doi.org/10.1016/S0736-0266(00)00028-0] [PMID: 1134 7692] ]. Secondarily, we assessed the sonographic status of the other rotator cuff tendons. Almost one third of the patients who were submitted to a posterosuperior tendons’ repair, were sonographically found to have rotator cuff retears. Surpri-singly, there was no clinical indication of subscapularis tendon retear in this category of patients. So, we deduced that the presence of tears elsewhere in the rotator cuff and their postoperative failed repair did not influence the outcome of the subscapularis repair. We recognize also some limitations in our study. Weak points were the relatively small number of patients included, the retrospective design of the trial and the absence of any control group. A clear limitation of this study was that the inter-observer and intra-observer reliability were not assessed. Furthermore, ultrasound has been used as the sole imaging modality for postoperative assessment. However, postoperative shoulder ultrasonography has the advantage of being less susceptible to postoperative artifacts that may be seen on MRI, while it is nowadays established as an accurate diagnostic tool for the follow-up assessment of patients who have undergone an arthroscopic rotator cuff repair [27Lam PH, Hansen K, Keighley G, Hackett L, Murrell GA A. A Randomized, Double-Blinded, Placebo-Controlled Clinical Trial Evaluating the Effectiveness of Daily Vibration After Arthroscopic Rotator Cuff Repair. Am J Sports Med 2015 Nov; 43(11): 2774-82.-29Chung SW, Huong CB, Kim SH, Oh JH. Shoulder stiffness after rotator cuff repair: risk factors and influence on outcome. 29(2): 290-300. [http://dx.doi.org/10.1016/j.arthro.2012.08.023] ]. Internal rotation lag sign depicted the highest sensitivity amongst clinical tests, while Napoleon sign was the most specific.We strongly support the use of the subscapularis-specific clinical tests as a composite, in combination with a specific interpretation of their results. If all tests are found negative for retear, then we could safely assume that the arthroscopic repair remains intact and no further diagnostic examination is necessary. On the contrary, if at least one subscapularis-specific clinical test is positive for retear the patient will likely require an ultrasound or MRI for definite diagnosis. Patient consent was taken from the patient prior to the publication of this article. All authors declare that they have no relevant conflict of interest. Lam PH, Hansen K, Keighley G, Hackett L, Murrell GA A. A Randomized, Double-Blinded, Placebo-Controlled Clinical Trial Evaluating the Effectiveness of Daily Vibration After Arthroscopic Rotator Cuff Repair. Am J Sports Med 2015 Nov; 43(11): 2774-82.